El Niño-Southern Oscillation Myth 2: A New Myth – ENSO Balances Out to Zero over the Long Term | Watts Up With That? I bought Bob Tisdale’s book and the ressemblance of this post : striking! Perhaps the only issue is the definition of “long term”. Perhaps if we had a few thousand years of ENSO records, it would “Balances Out to Zero over the Long Term”. If that’s true, then the current warming trend will soon reverse and become a cooling trend. That means we reach the same conclusion as Bob. The current warming trend that has been attributed to CO2 is natural instead. I bought the book and its a fascinating read. It takes more than one sitting to finish it but well worth the effort. Thanks Bob. A piece of a comment of mine in Tips & Notes is happy here. The ENSO figure picked up Monday morning displays as zero on the ENSO meter on the right side nav bar. Just a question from an ignoramus, re Fig 7-10 and 7-11: How do we know that El Niño 3.4 anomalies do not reflect the combined effect of ENSO plus general trends in SST? Are El Niño anomalies net of general trends in SST? If the seas were generally warming (naturally or due to human factors), the region of the Pacific Ocean covered by the El Niño 3.4 anomalies would show a rising temperature trend even if ENSO’s ups and downs cancel out. About halfway down the page. Most are for the last ~500 years but a couple are for over a thousand. Of course these are proxy records, based on SST from corals and rainfall patterns from sediments. If you want to throw out proxy records you also have to abandon any evidence for the MWP, Roman or Minoan warm period and in fact any evidence for ice-ages or climate variation before the instrumental era. Most scientists accept proxy data, with the known limitations of resolution and showing variation or anomalies from an indeterminate absolute value. But that still enables useful science to be done. for instance the relationship between the PDO and ENSO is observable in the longer paleoclimate record. Only “zero” might not be zero. And we don’t know where zero is. The completely different mechanisms for El Nino and La Nina result in an unpredictable and aperiodic oscillation. ENSO is like an enclosed grandfather’s clock with a mouse running up and down the pendulum. Only the mouse knows where zero lies, and he’s not telling. I’m not convinced of the value of a running total of any anomaly series. Depending on the base taken, the individual anomalies will differ by a constant. If we then take running totals for different base values, they will differ by a straight line. So, if we choose a base value that is 1 lower than the previous base, the 1st anomaly running sum value will be 1 higher, the 2nd will be 2 higher, the 100th value will be 100 higher, etc. There is a single value of the base which can cause the running sum to zero out. All other values will show either a rising trend or a falling trend, by this is just an artifact. BTW, choosing a zeroing base for your graph shouldn’t change the shape; all it should do is reorient it downward. This is not my area of expertise, so I could be wrong – but I don’t think so. @ Izen11:20 We need proxies for the Medieval and Roman periods? Human history is not good enough for climatology? Your buddies on the team didn’t do so good with their proxies, when they diapered both. Disappeared.Mind you maybe the baby reference fits. I deal primarily with the satellite era, the last 30 years. If the manmade global warming hypothesis does not work during that period, and it does not, then there’s no reason to believe it works in others. Would you be willing to speculate that the Little Ice Age may have been induced by a multicentury period dominated by La Nina’s, and the gradual warming since the end of the LIA has been brought about by a greater frequency of El Nino’s ? Have you examined the data (proxy) for tropical SST’s from those centuries, and does it support (or not) such speculation ? As I mentioned in the post, the resulting curve of the running total is dependent on the base years. Typically, a 30-year term is selected as base years for anomalies, so for a NINO3.4 dataset starting in 1900, you’ve got 80+ choices for 30-year windows. However, to achieve a curve that returns to zero, all you have to do is neuter El Niño and La Niña. You can do that by using the entire term of the data as the base years for anomalies. But why would you attempt to neuter El Niño and La Niña events? Have El Niño events been stronger since 1976? Yup. Even Trenberth acknowledges that in the paper linked above. He selected 1950-1979 as the 30-year period for base years, because the stronger El Niños since 1976 biased the data. Just to reiterate I love your work. If balance means something else in this context, then nothing below is relevant. 2) I think I am agreeing with Bob Shapiro at 11:39 am in that the running total of temperature in the Nino3.4 box does not tell us anything about heat update and release in the corresponding events. Indeed, I think the notion that the events balance does not further the alarmist cause. They would want La Niña to dominate with the excess (aka missing) heat disappearing into the depths of the pacific ocean. And a measurable portion of the of that heat is due to down welling IR (I know, you address this in your book). – There is no physical basis that causes them to be balanced. – You show the migration of accumulated heat following a La Niña to be complex and not remaining in the Pacific. – I cannot think of a way to set up a boundary for energy flows over which the notion of La Niña and El Niño being balanced makes sense. I suppose one could take the Pacific as a whole and define balance to include all atmospheric and oceanic energy flows and allocate all ENSO neutral conditions to an adjacent La Niña or El Niño but now I have established a tautology. Can you play around with the base years and make those other datasets work, surely the difference lies in the base years as you have alluded to? Or maybe just make them more “positive” so the sums go sky ward? ps. Bob, did you just falsify man made global warming? lol !! A scatter plot with temp correlation would be nice…. The human eye often tricks you into what you want….I’m guessing while it looks good, the relationship is probably not so good? …..that the running total of temperature anomalies in the Nino3.4 box does not tell us anything about heat update and release in the corresponding events. I think the same is true for the original form of the statement – but I want you to know that I understood the figure. I don’t speculate. I report on data. My posts deal primarily with the last 30 years of sea surface temperature data—the satellite era. Paleoclimatological data is make-believe data. There are no similarities between the two reconstructions. They would have no value in a study of the impacts of ENSO on global temperatures. I have a hypothesis. My hypothesis seems to only hold true for one part of one ocean from one set of data narrowed down to one time series. I see this could be a problem. Having to ignore vast swathes of other measurements with poor or even no justification doesn’t help it either. Reading back over my work I realise I have suggested that my special interest area is THE ONLY influence on SSTs by saying, “If, over the long term, El Niño and La Niña events balanced out to zero, then a running total of NINO3.4 sea surface temperature anomalies would equal zero”. Again I realise I have left out any justification for this and it further makes me question my hypothesis and objectivity. Then I look at my graphs and realise my hypothesis violates the 1st Law of Thermodynamics which tells me that I must minus the work done on the atmosphere and land by the ocean from the OHC. They cannot ALL warm. Now I’m thinking my hypothesis must be wrong and leads me to think that there has to be an energy imbalance in there somewhere. I jump on google scholar and after a few seconds I can see hundreds of papers with satellite measurements showing this imbalance I just hypothesised does exist. I re-evaluate my hypothesis to include this ‘new’ information. Nice analogy. Yes, its far more likely that ENSO is a non-balanced process itself and “the rest” of the atmospheric and oceanic processes do “the rest” of the balancing. The data is real enough. The interpretations are where the make believe begins to appear. Though when you start to look at “corrections” and “adjustments” that modern data is being subjected to, I would begin to worry about “post-normal” data processing. We do not know what YOUR hypothesis is. What’s your point? Did you miss the intent of the post? Did you read the post? Did you understand the post? Apparently not is the answer for all three questions. El Niño or La Niña are phenomena are the consequence of the relative northern and southern hemispheres Mobile Polar High influence on the meteorological equator at a few years scale. For instance, if the South pole generates more powerful Mobile Polar Highs (MHP) than the North pole does, this generally means that southern polar MPHs are more powerful and thus traveling farther north, which helps the meteorological equator to stay higher than usual in the northern hemisphere, helping cold water upwelling for South America to flood the Eastern Pacific. La Niña can then develop. On top of the few years El Niño / La Niña SST’s cycle, you can add a longer terme cycle (60 years) which complicates the temperatures anomalies readings. Nothing but a good book from Marcel Leroux will explain it all. The tropical Pacific OHC data contradicts this statement. Agreed. I think everyone is reading too much into this post. This post is a simple response to a nonsensical statement made by someone at SkepticalScience who has no understanding of ENSO. An ENSO index only represents the impacts of ENSO on that index. It does not account for its aftereffects. That is, an ENSO index accounts for the temperature of the warm water released by the El Nino; it does not account for the volume of warm water released or the aftereffects of that warm water. ENSO may or may not balance out over the long term, however in this case long term is 60 years at an absolute minimum. If ENSO doesn’t balance out over the long term, where is the excess energy going? If, for argument’s sake, the sun put 100 hypothetical units of heat into the ocean, then what is stopping this extra heat from being split up and distributed, warming different domains of the Earth system? Let’s say 75 (?) of those units are spent warming the surface of the global ocean. From there they move on to warm the troposphere, mostly through latent heat transfer. It’s the same energy. That’s what heat transfer is all about. In the end, most all of them are radiated back to space, having warmed the world on their way. But there are still 25 units of energy left, now stored in the ocean, Earth’s supreme solar heat reservoir. The ocean accumulates heat. It ALSO gets warmer. Even while already (in our hypothetical example) having warmed the rest of the world. How about that? This mythology is not unlike any other in that we humans chooses the fiction we believe calling it theology, dogma, ideology or any number of adjectives. No matter how you cut it or what base you choose to use since ENSO has no true periodicity or trend any correlations are probably more chance then reality. – Into the deep ocean. – Into other regions of the Pacific. I’m not sure why people feel the need to balance. The temperature in any part of the planet can go up or down 20c in a few days (or less under the right conditions. There’s nothing to balance that change out. Granted some cooler flows are associated with warmer flows elsewhere but there’s nothing making that a rule. In fact the average temperature of the atmosphere can rise 0.2 C in a week or two, an astounding rise compared to the amounts argued about in longer time contexts regarding weather event attribution. There’s nothing in particular that counters those rises (and falls). There is thermal inertia but that’s subject to the ENSO that Bob talks about. There is more convection in some locations, more wider scale storms (or less). There is outgoing longwave from Stefan–Boltzmann subject to greenhouse gases which are highly variable. And of course the sun is not constant, but it is mostly constant enough. Here we go again. He is pushing his book that gets it all wrong, apparently with Anthony’s approval. I have not seen the paper he speaks of but it does make sense if you allow for major exceptions. These exceptions would be step warming or cooling incidents where global temperature changes discontinuously. Among them I count 1940 (World War II cooling), 1976 (Great Pacific Climate Shift) and 1998 (step warming by super El Nino). There is no explanation for any of these. As to the role of Nino3.4, it only catches the eastbound flow because it sits on top of the equatorial counter-current. It misses the westbound flow entirely because that one follows the equatorial currents, gathered together there by the Walker circulation. If left to themselves these two balance out beautifully as the unchanging global mean temperature of the eighties and nineties demonstrates. Indeed, this “where is the energy going” is the signature of a stupid climate question. Combine the massive heat capacity of the oceans with the sharp vertical temperature gradient and the non-equilibrium chaotic dynamics of the ocean-atmosphere system, and the question dissolves like a soluble aspirin into the ocean. Heat can easily “disappear” in the oceans themselves of out to space due to the smallest of changes to ocean-driven cloud albedo. The westbound flow results from a phenomenon called Rossby waves. And you’re right. They’re off the equator at about 10S and 10N, so the NINO3.4 region cannot account for them. I suggest you go study the ENSO recharge-discharge theory. Then try accounting for the warm water that’s left over after the 1986/87/88 and 1997/98 El Niño events. After you’ve done that, come back and explain how they balance out. Keep in mind, you picked the time period, not me. Want to try TLT anomalies? I have to ask: Upon what are you basing this proclamation when the topic of discussion is the sea surface temperatures of the past 31 years? Normalize the series by removing the average from each monthly value. Perform cumulative sums….and its gone. A more objective base period would give you an average of ZERO. Exactly. The additional warm water leftover from El Nino events is the reason why global sea surface temperatures have warmed over the past 31 years. Here’s a quick overview. We’ll divide the sea surface temperature anomalies of the global oceans into two subsets: the East Pacific (90S-90N, 180-80W) and the Rest-of-the-World (90S-90N, 80W-180). Hi Kristian, in your example the only body accumulating energy is the ocean. Latent heat is a transfer you are correct. Key word being transfer, the atmospheres gain is still the oceans loss as that latent energy IS LOST via condensation. For your example to hold true the atmosphere would have to be storing a portion of its units also, exactly as the ocean does. For the temperature of both to increase they BOTH need to store more energy. Enhanced GH is the only thing that can explain that. You have falsified nothing. All you’ve done is linked an ENSO index that’s not current and made a nonsensical claim. Go back and read my post. The obvious intent of the post eludes you. Further proof that you didn’t bother to read the post, X Anomaly. Trenberth chose the base period to elimate the bias toward El Nino. What part of “whereas the period after 1979 has been biased warm and dominated by El Niño events” didn’t you understand? I wonder if anyone can find a base period which ensures there is just as much data above the zero line as there is below it? It’s important because slightly more data above the zero line will cause a significant positive trend with cumulative sums. Conversely, slightly more data below the zero line will cause a significant negative trend with cumulative sums. The average of all the data must equal zero. For almost all climate analysis it doesn’t matter if there is a finite surplus, except in the case of cumulative sums. Fundamentally assumes the system of ocean and atmosphere was in equilibrium and is warming from there (due to an enhanced GH effect). What if it is not yet in equilibrium? Take 100 random integers between -5 and 5. Copy series and right click Paste into excel. Average the series, if the answer is positive, then a cumulative sums trendline will likely be positive, if the answer is negative, then you already know the trendline will likely be negative. Perform Cumulative sums of data in column A, by entering =A1+A2+B1 in cell B2, then drag bottom right corner of cell B2 down. Insert line chart and plot column B. You are doing nonsense math. If you subtract the mean from each datapoint of any cumulative sum you will always end up with zero. Is there a mechanism by which ENSO significantly influences how much infrared radiation escapes the earth or how much sun radiation it absorbs? Firstly, you need to put =A1 in cell B1 and =A2+B1 in cell B2. Otherwise you’re not doing your cumulative sum correctly. Do you know what I found? The final value in cell B100 was exactly 100 times the average. If it averaged out to zero, the final value in cell B100 was zero. Otherwise, if the average was not zero, it was above or below zero, as appropriate. This shows that a random sequence of finite length is not guaranteed to ‘average out’ to zero. The applicability to the issue at question is that even if you assume that in the long term, the ENSO cycle will have a zero effect on global temperatures, the question is how long is “long term”. Clearly, for a range from -5 to 5, a sequence of 100 numbers is not long enough (your exercise has proven this). Clearly, 30 years of ENSO isn’t enough, either. I suspect the true answer will be in the 1000’s of years… but what do climate models assume? If they assume it’ll average out over 100 years (to make their projections accurate), then I strongly suspect that they’ll be disappointed. Indeed the recent Rahmstorf et al (2012) paper shows the same thing – they had to take the effect of ENSO out to get climate models to match observations… clearly showing that in the climate model prediction ranges being examined in that paper, that ENSO does NOT average out to zero. Remarkable. A running mean perhaps? Yes the probability of that happening is slightly above zero. I want to take a shot at this question – but in not technical terms. During repeat La Ninas, more wind piles up tropical ocean water to the west near the low latitudes. The warmer water in the west concentrates there (it does not go away it’s stored deeper down). This exposes a larger extent of cooler water from there all the way to the East. The cooler water evaporates less moisture, creating fewer clouds. Therefore, more of the sun warms the ocean. So ironically, though La Nina’s have an immediate chilling effect on the atmosphere of much of the planet, the planet stores more energy on net –in the oceans, which then can be released later. I have given this a little more thought, To be objective, I think it is best if one gets the original data, which has not been anomalized. Which is very close to zero! For Bob’s analysis we need sea surface data all the way back to 1870’s. If someone can find it…. Then we’ll sea what it looks like, if it matches the temp record….objectively. I read your book and it is very well done. The graphs and animations are quite convincing. I think that you are right and this is one of the contributors to global warming. However, the end result is still handwaving, and is not significantly different from the hocky stick of Al Gore’s movie. Correlation is good evidence of a relationship but often does not prove cause or effect and certainly is not scientific proof. When is someone going to use basic physics and chemistry, at the molecular or even atomic level, to establish how the ocean waters and the atmosphere act and react within their global environment? This was accomplished, with some limitations, many years ago for the ionosphere using laboratory measurements of the basic processes. The error is not the running total. The error is assuming that ENSO is represented by the ENSO index, which is what I have been fighting for 4 years. The ENSO index only represents the impacts of ENSO on the variable being measure by the ENSO index. The ENSO index does not represent the aftereffects of the processes of ENSO. In addition, the stronger trade winds push the cloud cover farther to the west. The data you linked is not based on the HADISST dataset used by Trenberth in your original link. The NINO3.4 data at the ESRL website is based on NOAA’s ERSST.v3b sea surface temperature data. Two different datasets. You need to stay with HADISST based NINO3.4 data, otherwise you’re confusing yourself. More proof that you didn’t read the post. The data sources are linked near the end. Yet even more proof that you didn’t read the post. I think it needs to be proved that a cumulative series, based on data which averages out completely, can indeed produce a significant trendline, but will still average to zero. From -3π to -π, cos x is the camel’s hump, and has zero average and zero trend. From -3π to -π, sin x has a significant trend, and also has zero average. Sin x is the cumulative sum of cos x, just with different amplitude. I see many people here what the real base line is, one has to remember that our dear little planet tends to spend 90% of its time with a rather large ice cover. The real base line would lay some where in this cold period. Interglacials I would imagine are climate on a knife edge, where ups and downs really are dependent on the odd fluttering of a butterflies wings. The planet balanced such can be effected with very minor external inputs such as history has noted. Bob, as you can see in the sin /cosine example, when cos x is above the zero line, sin x shots up like a rocket (sound familiar ?). conversely, when cos x is below the zero line, sin x sinks like a boat. I can’t make it any clearer, sorry I’m not confused. I think one needs to show the physical mechanism here whereby the accumulation of the ENSO impacts actual temperatures. I’m not sure the 1877 super-El Nino is still impacting temperatures today, but the series of successive El Ninos from 1939 to 1942, left a strong lagged response in rising temperatures throughout the mid-1940s. The string of successive La Ninas in the early 1970s left us with a deep downspike in temperatures up until 1976. These also left a signal in the AMO and participated in its longer-term up and down cycle. I think the question is time. How long does an accumulation actually work. It has to have a limit in physical mechanism terms. X Anomaly: You’re wasting your time. Have your read the post or have you only looked at the illustrations? All you’re doing is confirming what I wrote in the post about Figure 7-11. You’re spending all of your time to prove nothing. The only way you can prove that Figure 7-11 is wrong is to use HADISST-based NINO3.4 anomaly data with the base years of 1950-79. If your running total is different, then we can discuss what you’ve done wrong. I’ve aleady done that, extending the discussion of the East Indian-West Pacific shifts as far back to the early 1900s, but this post has nothing to do with that. This post is a simple response to a nonsensical statement made by someone at SkepticalScience who has no understanding of ENSO. There are significant differences. 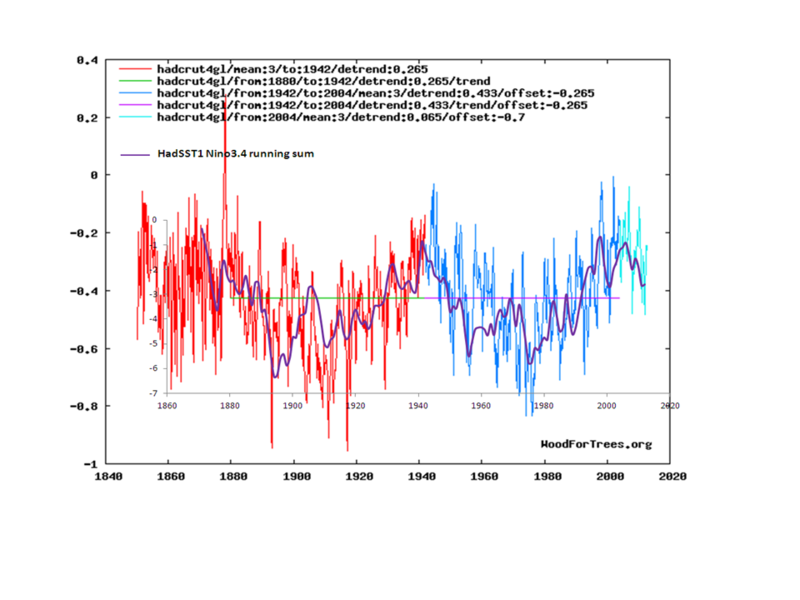 The hockey stick is based on bogus statistical manipulations of paleoclimatological data, where I’ve presented satellite-era sea surface temperature data and other supporting data for that period. Al Gore was parroting the flawed findings of others, where I’ve done my own research to illustrate the causes and impacts of ENSO residuals. I’ve earned the right to wave my hands; Al Gore has not. And I’ll continue to wave my hands. Other than that, thanks for the kind words about my book. I’m glad you enjoyed it. This is incorrect. In fact, warmer oceans mean a warmer atmosphere, not the other way around, as AGW theory has it. GHG effect cannot warm ocean because water is opaque to infrared (see absorbency spectrum of water). The results are startling. According to widespread beliefs, a so-called law of averages should ensure that in a long coin-tossing game each player will be on the winning side for about half the time and that the lead will pass not infrequently from one player to the other. Tree ring data becomes make-believe data when used in paleo-climate reconstructions, as such data simply cannot yield a valid result, however applied. Tree rings simply are unsuitable as a proxy for past temperatures. For confirmation of this, see Jim Bouldin of RealClimate, who discusses the issues at his blog. All paleo-climate reconstructions using tree-ring data are invalid, according to Jim Bouldin of RealClimate. This is also my point of view. El Niño and La Niña cannot net out to zero because they represent the tail end of the deep ocean conveyor that operates on time scales of hundreds of years. It is not a zero sum game. Energy that was stored centuries ago in the deep oceans upwells to the surface during one phase and is blocked during the other. The effect on the earth’s climate that results, whether there is net warming or cooling, that is determined by what the climate was like hundreds of years ago. So we gain an increment of temperature with every El Niño? When will it all end? At any rate, do you still see a possibility of a 2013 El Nino, or has the cooling become significant enough that we might have “La Nada” or ENSO-neutral conditions in 2013? This is not WHY the Rest-of-the-World data warm. It is how the heat is distributed. If there is a step-wise increase in temperature in an area, either other areas have cooled, and we can expect (long term) there may be a fluctuation back, or there has been an increase in heat energy in the system, and we would not expect a return to the the status quo ante. As best I can tell, and I am admittedly an amateur, ENSO describes how heat moves. It doesn’t tell us the source of the heat, whether from “random” shifts in the distribution, or from some other source – natural or mad-made global warming. At least not at our present level of understanding. And of course the sun is not constant, but it is mostly constant enough. Constant enough to support life for billions of years? Or does life modify the earth such that the earth’s climate and life have co-evolved to limit the effects of the variability of the sun? 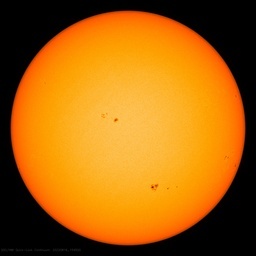 Certain aspects of the sun are relatively constant over the very short period of time we have been able to measure them. These are the aspects that our physical sense can also detect. Other aspects are highly variable and are ignored by those that wish to prove that humans control the earth’s climate. Since we can’t see or feel these aspects of the sun, it is easy to assume they have no effect. Having witnessed first hand the global cooling scare, and all manner of human activity blamed as the cause, it is only reasonable to doubt the same scientists making the reverse claim a generation later. Since they obviously had it wrong before, it seems all the more likely they have it wrong this time as well. Each generation of climate scientists is no more than mayflies in geological time. They look at the cooling of the planet at night and the warming during the day and proclaim global cooling and global warming. Wow.. it seems that Tisdale has identified an upward trend in Pacific Ocean sea surface temperatures. Doesn’t that sound consistent with global warming theory? …X Anomaly is simply confirming what I wrote in the post. Now I’ll ask you, have you read the post? My guess is that you haven’t since you’re attempting to belabor a valueless point. The observable increments are with the major El Nino events, like the 1986/87/88 and 1997/98 El Ninos, both of which were East Pacific El Ninos. There may have been a minor incremental increase with the 2009/10 El Nino, but it’s still a little early to tell. So it’s really not with every El Nino. That Rest-of-the-World data represents the Atlantic, Indian and West Pacific oceans from pole to pole (90S-90N, 80W-180), or about 67% of the surface area of the global oceans. It’s the Rest-of-the-World as opposed to the East Pacific which hasn’t warmed in 30 years. If the 2012/13 ENSO season shows up as an “official” El Nino on the ONI index, which I doubt, it would be a very weak El Nino. Bob keeps reminding us that they are NOT “converse phenomena”. Thought provoking article, as usual, Bob. Fred Berple says: El Niño and La Niña cannot net out to zero because they represent the tail end of the deep ocean conveyor that operates on time scales of hundreds of years. It is not a zero sum game. I was thinking along those lines, too, Fred. I don’t despair that humans can’t better understand climate change. But in my opinion, we will never get there by analyzing spotty SST data or land based near-surface air temperatures (ignoring atmospheric humidity, in the bargain). But we may get there if we focus on high resolution studies of ocean currents and their energies over time. Of course, such an approach would not suit short-term political power grabbers and their panicky alarmist friends. Dickey, J.O. ; Marcus, S.L. ; & Chin, T.M. (2007). Thermal wind forcing & atmospheric angular momentum: Origin of the Earth’s delayed response to ENSO. Geophysical Research Letters 34, 7. Häkkinen, S.; Rhines, P.B. ; & Worthen, D.L. (2011). Atmospheric blocking and Atlantic multi-decadal ocean variability. Clement, A.C.; Burgman, R.; & Norris, J.R. (2009). Observational and model evidence for positive low-level cloud feedback. Science 325(5939), 460-464. doi: 10.1126/science.1171255. 4. “[…] our predictive tools contain major biases that are symptomatic of unrealistic rain physics. While I believe the changes that are likely to occur are primarily driven by changes in the large scale atmospheric ﬂows, we have to conclude our models have little or no ability to make credible projections about the changing character of rain and cannot conclusively test this hypothesis. 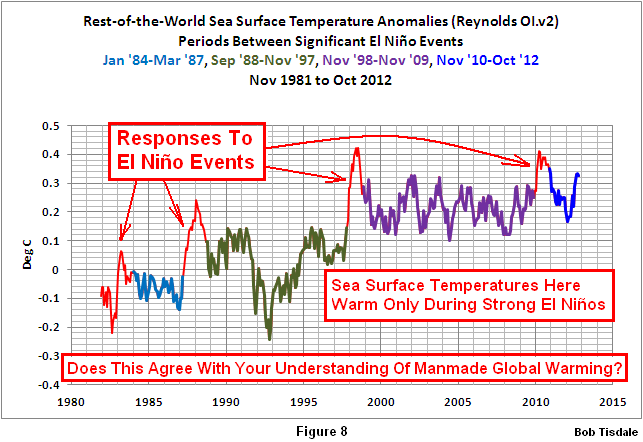 ENSO anomalies must balance out over the time period used to set the baseline: the mean anomaly is by definition zero. If a portion of the record is selected as the baseline, the trend of the running sum will depend entirely on whether the baseline chosen has above or below average ENSO. Bob Shapiro (December 11, 2012 at 11:39 am ) is perfectly correct. Even Bob Tisdale admits it “Also, it only works with the base years of 1950-1979″, so cherry-picks the baseline to get the results he wants, and creates yet another myth. I found http://chiefio.wordpress.com/2012/12/12/tropopause-rules/ to be an interesting tie-in – he says that cold/warm ENSO conditions follow with a lag the UV that makes it into the oceans. “I think one needs to show the physical mechanism here whereby the accumulation of the ENSO impacts actual temperatures. Dickey, J.O. ; Marcus, S.L. ; & de Viron, O. (2003). Coherent interannual & decadal variations in the atmosphere-ocean system. Geophysical Research Letters 30(11), 1573. Interpretation: Equator-pole heat & water pump Doppler effect (scrambled by ENSO in a manner that baffles conventional exploration). NASA JPL has my attention. They appear to harbor North America’s strongest concentration of aggregate constraint awareness. All of these observational insights are consistent with Bob Tisdale’s narrative. Yes, and detrending the temp record would remove the AGW, right? You will then find that the ‘AGW-trend’ is 0.07 C/dec and the ‘ENSO-trend’ is 0.13 C/dec (0.4 deg between 1970 and 2000). You’re correct about the anomalies balance out over the time period used for the baseline, but the “myth” is that ENSO will balance out to zero over the long term. I think Bob has categorically shown that “long term” is not 31 years (the satellite era data) and is probably not 100 years (based on the extended data of lower quality). The base years picked is irrelevant – his comment is only on the shape of the graph produced, not the end result, which is to show that ENSO does not balance out to zero (unless you use the entire dataset as the baseline, which means the balancing out is trivial and meaningless). Please remember that the entire reason for this “myth” is to counteract claims that climate models are flawed because they can’t reproduce ENSO effects. Therefore, we need to look at the “myth” keeping the climate models in mind. As a hypothesis, the idea that ENSO will balance out in the long term is not unreasonable, but someone will have to define “long term”. Without that definition, the hypothesis is not falsifiable and hence not scientific. Personally, I would think “long term” would be at least 1000 years (assuming the hypothesis is true), and as such the hypothesis is useless from a climatic modelling point of view – the models would have to include ENSO effects because the effects will NOT balance out to zero in the range of dates the models work with. This would mean that any model that doesn’t reproduce ENSO effects is flawed and is not representative of the real world, and hence “projections” based on the climate models will also be flawed – a fact demonstrated by the recent Rahmstorf et al (2012) paper. Is there any evidence that ENSO is non-stationary? Ironically, it has traditionally been warmists who have tried to scare the wits out of everyone by making nonsensical claims that “ENSO is changing in the long term”. Now it seems Bob has caught the disease. But like much of the so called “science” of climate change, it all turned out to be statistical garbage. There is no proof that ENSO doesn’t balance out. Period. X Anomaly, there is no substance in your assertion. ENSO is not a stochastic process at any level. In your fantasy world, you may believe you’ve falsified something. Your assumption is that the ENSO index you’ve used (NINO3.4 sea surface temperature anomalies) represents the all of the processes and aftereffects of ENSO. It does not, which is why I cautioned you in the first place. I’m not sure why that’s so hard to understand, but be happy—go off and spread your nonsensical opinions. I’m sure the other anthropogenic global warming blunderers will be happy to hear from you. That’s a odd interpretation, because it conflicts with what was written in the post. It leads everyone reading this thread to conclude that you hadn’t bothered to read the post–or that you have selective-quote syndrome. I haven’t cherry-picked the baseline. I gave a specific reason for selecting 1950-1979. If you’d like to criticize those years, please address your complaints to Kevin Trenberth. Second, I did not create a myth. I, in fact, cautioned about the graph, noting that Figure 7-71 was a curiosity. You might have understood that if you had read the post. Well then, it will certainly end when the Rest-of-the-World’s oceans are as warm as the East Pacific. Or don’t you think it’ll go that far? Never said it was. Just said there was no evidence that it had changed. Making stuff up you are. There is no evidence that it hasn’t changed either, does that make you feel better? Does that make you feel better? Or are you out of “substance”? X, ENSO can’t be nonstationary as you claim because ENSO is not a stochastic process (or variable). It is a large set of variables or measurements, none of which are stochastic or stationary. Did I get it right? I do not want to misrepresent your science. I think you make a lot of sense and back it up with real observations. Never made the claim that ENSO can’t be non-stationary. ENSO does however, if you take any set of variables or measurements, exhibit stationary behavior. Although that in itself does not prove that it is stationary or random, it does counter bogus claims (such as those made by Trenberth and Hoar back in 1997, and Bob Tisdale in this post) that the mean state of ENSO is changing. The evidence is on the side of the stationary argument…it isn’t changing much if it is! The uptick in el nino activity at the end of a series, as argued by Trenberth and Hoar 1997, was destroyed by the prolonged La Ninas around, 2000, 2008, 2011 etc, which have cancelled the alarmist claims made by alarmists. Whether it is random or not is an unknown, probably a mixture of the two. As for arguing that it doesn’t cancel out, I can only chuckle. ENSO represents the global climate like no other phenomena on earth, the fact that it has little trend may suggest that the climate sensitivity is very low. Stable and Counteracting. A possible negative feedback. Why on earth would you argue the opposite? You really do need to be careful what you wish for! Your first assertion is incorrect. The proof that ENSO doesn’t balance out is the graph in the article that shows that the net result of ENSO over the satellite period does not balance – there is a net positive result. As only one example is required to disprove a statement, your statement, as stated, is disproven. Now, if you’d said “There is no proof that ENSO doesn’t balance out over a long period of time.”, then you’d be able to legitimately argue that the satellite period is not long enough. But if you do that, you’ll need to define how long is “a long period of time” because otherwise the statement is meaningless. Your second assertion is equally incorrect because I’m sure someone can find a period of time over which ENSO does balance out (especially if they choose the period of time that corresponds to the baseline for the anomalies – it becomes trivial that ENSO will balance out for that period because, by definition, it will). Incorrect, the reason it doesn’t balance out in that particular case is entirely because the reference period of which the anomalies are related to are significantly cooler than the period in question. That has absolutely nothing to do with ENSO,…… IT IS A HUMAN CONSTRUCT. “NOAA uses 1971-2000 as base years” NOAA did it! Bob did by restricting it to the sat period! Wasn’t ENSO! It wouldn’t matter except for these silly cumulative sums! The 70’s where anomalously cool, and do not make up a significant portion of the satellite period. Including the 70’s in the base period will distort the anomalies, making them warmer. When cos x is above the zero line, the cumulative sum (sin x) shots up like a rocket…….Hey, why not make one anomalously warm year, like 1997, the reference period? Imagine the global cooling trend cumulative sums would make! The trend in the example you gave is entirely dependent on the reference. Nothing to do with ENSO. No one uses cumulative sums for this reason. Excellent. I will get you to write my comments from now on! They or who or what are indeed CHOOSING whether it cancels out or not. Nothing to do with ENSO. X, the physical processes cannot be stationary. In the neutral and La Nina phases, some of the stored energy is lost in the deep, that is, it warms 35 degree water to 35,5 degrees. For timelines that we care about that energy is gone. At the east end of the Pacific the upwelling cold water causes atmospheric cooling to a greater or lesser extent, but there’s no guarantee of any balance with the west end. The El Nino phase can release all or most of the stored energy before it is lost provided the El Ninos are frequent enough. The El Nino also spreads more clouds to preclude more storage so it is self limiting. I don’t know if that’s what you are confusing with stationarity or not. Completely wrong. The global warming and heat release from the 80’s / 90’s El Nino episodes is what strongly backs up my claim of low sensitivity (defined as warming from doubling CO2 or similar forcing). The current lack of extra heat release due to La Nina / neutral shows that CO2 has only the slow warming properties that backs up the low sensitivity argument. The negative feedbacks that limit the warming from ENSO or from CO2 or from any other variable factor are obvious to anyone who studies weather, ocean processes, etc. HM, Bob Shapiro, Richard Telford, and, yes, X Anomaly have it right. If you calculate an integral, or a running total, on some function for which you have to choose the zero point, then you’ll see both the integral of that function, and a rising, falling, or zero trend that depends entirely on the choice of zero point, regardless of who or what you can reference for that zero point. OK, so we don’t have to sum it up each time, and we don’t have to record the original sequence–not that either is much of a problem for 30 years of data, using a spreadsheet. The real question is this: given that temperature anomalies are simply temperature referenced to a particular zero point, why do we want to add up temperatures? If you sum up temperatures, positive and negative, over 10 days, and get an answer of, say, 1.7 degrees, what is that? What are its units? But there actually is such a measure as “degree-days.” It represents both time spent above (or below) a reference temperature, and the amount of temperature difference. For heating and cooling buildings, they use “heating degree-days.” These are summed temperature anomalies, with the zero point being the temperature where neither heat nor air conditioning are needed, perhaps 20 C or so. Heating degree-days are a proxy for total heat flowing in or out of the building, and give an indication of energy costs for heating and cooling. Farmers and gardeners use another kind of degree-day, the growing degree-day, to predict plant growth and flowering, etc. and also insect growth. The baseline temperature is taken as a minimum temperature for growth, and depends on the crop; 10 degrees C might be typical. So, back to El Nino and La Nina: the effect we examine is, roughly, the transfer of heat from waters warmed by El Nino to the rest of the world, or from the rest of the world to the cooler waters in La Nina. That heat transfer depends on temperature difference, and the time that this difference operates, so we can use a kind of degree-days. For studying heat transfer during El Nino/La Nina events, using the 1950 to 1979 base period for NINO3.4 sea surface temperature anomalies isn’t going to work: there’s nothing in the area at that temperature for the heat to flow to. We have to use the temperature difference between water in the El Nino event, and water in the rest of the world. 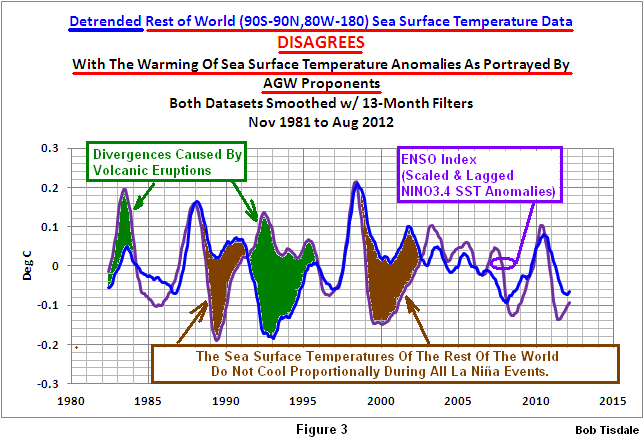 So, one could find the difference between, say, NINO3.4 sea surface temperatures, and global sea surface temperatures. Find this difference for each year, then take a running sum. If that sum shows a positive trend, you’re seeing heat flow, or potential heat flow, from El Nino to rest of the world. Perhaps it would be better to use water temperatures in, say, an area around the tropical Pacific, instead of in the rest of the world. That’s one of those practical details. Also, this process would be much more complicated than working with heating degree days for a building, since ENSO events involve cloud cover changes and changing strength of trade winds, so temperature difference wouldn’t necessarily correspond so closely to heat transfer. But it would be a start. When you start with the mean of 1950 to 1979 and use that as the baseline when you take a running total, you will be adding up the degree-days (roughly, heat contributions) of El Ninos and La Ninas since 1980. But you’ll also add up the shifting baseline of global temperatures themselves. Just looking at SSTs for El Ninos and La Ninas will include the effects of global temperature trends. Summing up those temperatures, expressed as anomalies, will also include an integral of the increasing global temperature upon which the ENSO temperature anomalies are riding. But that integral is included in figure 7-10 and 7-11 above; it’s clearly the main reason for the rising trends in these graphs. Subtracting global SSTs from the ENSO temperature anomalies before taking the running sum will remove that trend. Then any trend left will represent heat available to spread from El Nino to the rest of the world, and it will stand out clearly. As you might have noticed when reading my post, I wrote of the energy units originally received from the sun but subsequently partly transferred from the ocean to the atmosphere: “(…) most all of them are radiated back to space*. Not all, that is. The atmosphere will also gain a small surplus of energy, but its storage potensial is almost negligible compared to the ocean’s. The point here is that the 100 energy units hypothetically entered (and most of them also left again) the Earth system in one single package, and that was it. In the real world these ‘packages’ come in a continuous flow. If the solar input exceeds the output (through the common available heat loss mechanisms) from the global surface over a certain time, heat (excess energy) WILL build up in the system, BOTH in the ocean AND (by extension, because it draws its heat from the ocean) in the atmosphere – they both warm. A situation like this will for instance occur during a La Niña in the Pacific, and the buildup would be particularly noticable during a multiyear one. This is easily seen in the OHC data. JazzyT: Curiously, had looked into a discussion along those same lines a while back. As you could imagine, there would be numerous problems with any attempt to use the delta T. The eastern equatorial Pacific (NINO3.4 or Cold Tongue Index) sea surface temperatures haven’t warmed since 1900. They’re happy to be at about 27 deg C. But the rest of the global oceans have warmed around it from about 17.85 deg C to 18.45 deg C. During the satellite era, sea surface temperatures for the eastern equatorial Pacific are still the same, while globally they’ve warmed from 18.25 to less than 18.5. I can’t see how that would resolve anything. BTW, people are taking this much too seriously. I noted in the post that the running total in Figure 7-11 was a curiosity. I presented it in response to an argument by someone who has no understanding of the processes of ENSO. Bogus claims? Hmm. Apparently you’ve never done something simple like smooth the annual HADISST-based NINO3.4 SST data with an 11-year filter. The decadal variations clearly show the basic state changes with time. ENSO basics. Anyone who’s familiar with ENSO understands that. Why don’t you, X Anomaly? Those persons following this thread will see that you’ve done a brief statistical analysis of a dataset, about which you know very little. Mario, I didn’t say you were wrong. Sorry if you thought that. I simply added a little bit to the end of your description. The Rest-of-the World sea surface temperatures (not anomalies) have already reached the temperature of the East Pacific—or come close. I’ll be posting about it in a few weeks. It’ll be interesting to hear what people have to say, since we typically only look at anomalies. The reason it came up: someone thought there was a growing imbalance between the East Pacific and the Rest-of-the-World, when it’s the other way around. The Rest-of-the World data has been warming toward the East Pacific. I agree. I was very politely told that I hadn’t read the post. That just happened to be wrong. Just like all those how insist that temperature records should start in 1998 and show no warming, but insist that they are not cherry picking, Tisdale has chosen to use 1950-1979 as his baseline and of course he isn’t cherry picking. He has found a justification. An equally good justification could no doubt have been found for using any other period as a baseline, and as has been shown by many here, the choice of the baseline affect the trend in the running total. In a period of stable climate, ENSO will be stationary. That is will have the same mean and variance, measured over appropriate time scales, at any time. If the global climate changes, it is mathematically impossible for the mean and variance of ENSO not to change. Over the last 30 years, the global mean climate has warmed, so it is not possible for ENSO to have remained unchanged. Why would anybody expect otherwise? Increasing total global heat loss during warming/accumulation of heat? Cannot be if the atmosphere were the driving force. The atmosphere can only limit heat loss (either suppress it or keep it at balance) to force heat accumulation and warming. It simply knocks the bottom out the whole notion that AGW is behind the global warming we’ve experienced since the 70s. While reinforcing Bob’s ENSO explanation. Thank you Bob, for your feedback. I learn more from getting it wrong… and just wanted to be sure I was not misrepresenting your teachings! That would serve me poorly and others that I engage. Like most, I appreciate your help in understanding the mechanisms that lead to changes in climate, especially given that there is way too much bad information out there. I’m, looking forward to it. I hope you will document the history of this narrowing of the range of ocean temperatures. The reason is that even if a time series (e.g. : a sine) would perfectly balance out to zero over the long term this will not be the case if it contains some random error component – even if this component also finally balances out to zero as well. This is because the error component when integrated by a running total will result in a random walk behaviour. So this integration test simply doesn’t prove that ENSO does not balance out to zero over the long term. It’s as simple as that. The ENSO issue goes to the heart of the scientific question of climate dynamics, it is the sort-of lynch-pin of the issue. A lot of people here are having difficulty with the idea of something like ENSO moving global temperatures up or down. This is because the fallacy that lies at the heart of much current climate science is the total passivity of the climate. We are led to believe that the climate system is passive and that only upper atmosphere radiative balance is of any significance in any warming or cooling trend. This narrow and ignorant view excludes any consideration of the atmosphere-ocean as a complex system with non-equilibrium chaotic dynamics and huge heat capacity in the oceans. Internal climate dynamics can feed back to cloud albedo so that radiative forcing is not a simple linear constant. Oddly if you look at the field of palaeo climatology and the ocean simulations of glaciation and interglacials over the last million years or so, looking at phenomena such as the bi-polar seesaw north-south oscillations at the start and end of interglacials (like the seesaw that is starting now) it is well established that the ocean circulation alone can drive millenial scale fluctuations and oscillations in global climate. The disconnect between this understanding and other atmospheric climate science writing of ENSO as “noise” is astonishing. It never fails to amaze me how primitively territorial scientists in general are. There can be almost zero communication between different fields / tribes. Think just for a moment about the oceans and all this nonsense about atmospheric forcing and climate passivity will evaporate. …not vice versa. In other words, you’ve got cause and effect backwards. Then again, it’s not the entire ocean that serves as a heat sink for El Nino, it’s just the nearby portion. So, from the backs of three envelopes, as it were, a warming of about 1.5 degrees in the tropical Pacific would account for this. I think that’s more than has been observed, but other effects would also have to be accounted for. One thing is clear, as you mentioned, there would be a lot of problems trying to nail this down using Delta T.
BTW, people are taking this much too seriously. Perhaps–but it’s kind of fun, and once in a while, something useful falls out of such discussions. It never is as forcings are changing on all time scales. But that does not preclude considering the properties of a stable climate, such as equilibrium climate sensitivity. Your graph shows that ENSO variability affects global mean temperature. That has been known for decades. It does not demonstrate that the trend in global temperature is caused by ENSO.